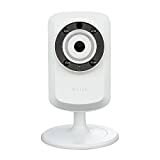 The DCS-932L/B Wi-Fi Day/Night Camera is a complete surveillance solution for your home or small office. The built-in night vision gives you 24 hour surveillance complete with motion and sound detection. It’s mydlink enabled too, so you can check on your camera anytime, anywhere from any PC, tablet, or mobile phone by downloading the app. The DCS-932L/B is a standalone surveillance camera that requires no special hardware or software, and can run independently even without a PC. This entry was posted in Discount Photography and tagged Camera, Cloud, Day&Night, DCS932L, DLink, Home, model, Wireless by Ball Photo. Bookmark the permalink.